Occupy and pay or site within 1/2 hour of arrival. Check out is 12 noon; check in is at 2 pm. Your paid campsite must appear to be occupied at all times to prevent another party moving in. Quiet time is from 10 pm to 6 am. No loud noises – sound travels! Please respect your neighbors. Maximum of 8 people and 2 vehicles allowed per site. Tents and equipment must be on gravel pad, not on vegetation. No cutting of any trees or branches. Do not peel bark. Do not wash or use soap at water spigots, pumps or in streams. Keep pets leashed and quiet at all times. Do not leave pets unattended at any time. Fires in fire grates only. Fires must be extinguished when unattended. Burn only wood in fire grates. This is BEAR COUNTRY. DO NOT FEED BEARS. Keep site clean. Place all garbage and food scraps in dumpster’s. Drive slowly. Children at play! Do not feed or approach any wildlife. Keep all food stored in vehicles, never in your tent. Dispose of garbage promptly in nearby campground dumpster’s. Never dump, burn or scatter food near your campsite or in the woods. Never leave food outdoors for wildlife or pets. 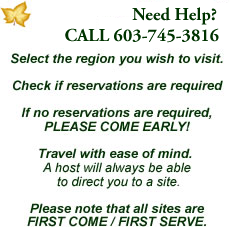 For more information see campground host or info board.